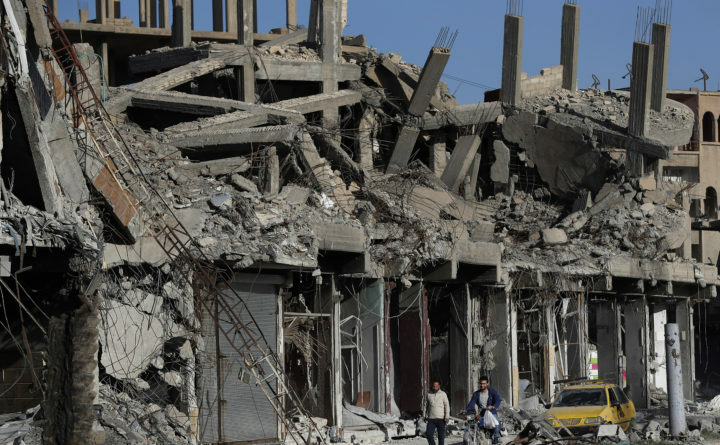 U.S. officials to say they were weighing options to strike Syrian government targets and the Syria’s state news agency initially blamed Monday’s strike on the United States. It backtracked following Pentagon denials. President Donald Trump had said Sunday that there would be a “big price to pay” for the attack that killed dozens of people in Douma outside Damascus, according to local medical personnel. Syria and Russia have denied the Syrian government’s involvement in that attack. A Syrian military source and the Russian Defense Ministry said Israeli fighter jets carried out Monday’s strike from Lebanese airspace. In February, Israel confirmed that it had targeted the same airfield in Homs, after an Iranian drone entered Israeli airspace. Eight warplanes were used in that attack, Israel’s military said, including one F-16 fighter jet that was downed by Syrian anti-aircraft fire. Footage from the area showed bodies strewn across the floor of an air raid shelter. Among them was a young man who appeared to have died foaming at the mouth and clutching his child. Other images showed piles of bodies inside homes or slumped in concrete stairwells, foam visible on their noses and mouths. The images recalled earlier chemical weapons attacks on civilians in Syria, including those involving the nerve agent sarin. A year ago, nearly 100 people were killed in a strike on the northern town of Khan Sheikhoun that the United Nations has blamed on the Syrian air force. In 2013, also in Eastern Ghouta, a sarin attack killed more than 1,000 people — an event that prompted then president Barack Obama to threaten military action against the Syrian government. The Washington Post’s Louisa Loveluck in Istanbul and Suzan Haidamous in Beirut contributed to this report.